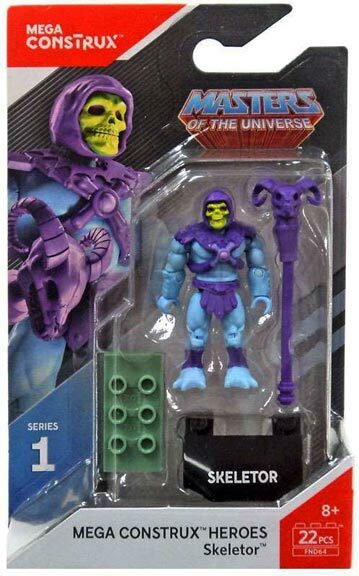 It's been quite a while since I've found some cool toys since Wave 2 of the Mega Bloks (now Mega Construx) Teenage Mutant Ninja Turtles mini figures, and today I came across an awesome new one- a tiny Masters of the Universe Skeletor. When I first came across the initial bunch of TMNT Mega Bloks figures I was immediately taken with how well done they were, wave 2 pushed that impressiveness even further. Then the toys were set back a little with the TMNT: Out of the Shadows film tie-ins, then they knocked it out of the park with the black and white Mirage Comics figures- they were downright spectacular! Once again, Mega Construx has done a fantastic job in making an absurdly tiny and somehow still manage to have a ton of articulation. This is a tremendous new mini figure that is great for collectors and fans. It's well painted, well sculpted, and articulated- these things are just plain amazing little figures. 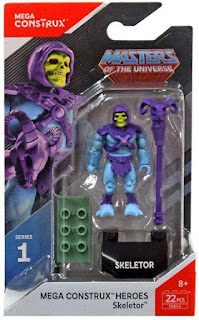 I only hope they will produce more than only He-Man and Skeletor, currently the only 2 available for the Masters of the Universe line. I'd really like to see Tri-Klops, Stinkor, Man-at-Arms, or any of the vast array of characters from the comics or show. I'll definitely pick up more as they come, but right now, this Skeletor is a perfect introduction to the set, and I can only hope for more to come. I've also seen they've released 2 figures from Star Trek: The Next Generation and 2 from Aliens. In reality, they could make a plethora of great figures for those series' as well- paving more paths for cool new figures now that the TMNT lines are becoming stale. I'm not kidding, there's a wealth of characters to choose from but they go with ones nobody wants, or more simple repaints/variants of the core turtles for each new wave comprising a full 50% of each new wave. Mix it up a little Mega Construx! People will buy the awesome figures when they aren't making the same mistake the old Playmates line made, no one wants the football Leonardo, or an Army fatigues Donatello, we'd rather have a cool Metalhead or Chrome Dome than the infinite number of variants.